Gridmonsters attack! | Mothers Against Wind Turbines Inc. Using this Orwellian “doublespeak”, Chiarelli failed to mention that under his 20-year “Feed-in Tariff” (FIT) contracts, we pay wind energy corporations much more, not less, than the rates we pay for each kilowatt of the hydro, nuclear or gas-generated electricity that wind energy replaces. In addition, in Ontario, most wind and solar energy is generated when not needed. In fact, wind and solar “farms” have become troublesome “gridmonsters”. They are uncontrollable, cruel and unreasonably costly. Gridmonsters have a licence not only to kill, but also to bill. Enabled by Ontario’s Green Energy Act , they drive up electricity prices while ravaging rural neighbourhoods and wildlife. They are malignant tumours attached to our electricity grid. They will continue to force electricity rates to rise unless we act now to bring them under rigorous control. When gridmonsters were in their infant stage, we were able to store their fluctuating output in rechargeable batteries for later use in electric cars or household power. But they have grown much too big for batteries, and they keep growing because governments keep feeding them subsidies. Gridmonsters were created by huge wind and solar corporations that lobbied governments for subsidies that guaranteed ongoing profits. That was the beginning of the scam, to which governments and citizens succumbed because of our fear of climate change. But unlike other energy sources, the sun and the wind cannot be turned on and off when demand fluctuates. On dark and still nights, gridmonsters lurk in rural fields. Then, when the sun shines or the wind blows, they invade power transmission lines. With government permission, they replace cheaper electricity from hydroelectric power, nuclear, or gas plants. Electricity rates then rise. When the wind dies or when the sun is obscured, the Independent Electricity System Operator (IESO) routinely fires up recently-added backup natural gas power plants. Whenever we can’t find consumers for this unneeded electricity, we pay solar and wind energy producers to not produce power. Rates rise more! Gridmonsters keep metastasizing. Ontario is exporting more and more excess green energy to Quebec or Michigan, at a loss of millions more dollars every month. 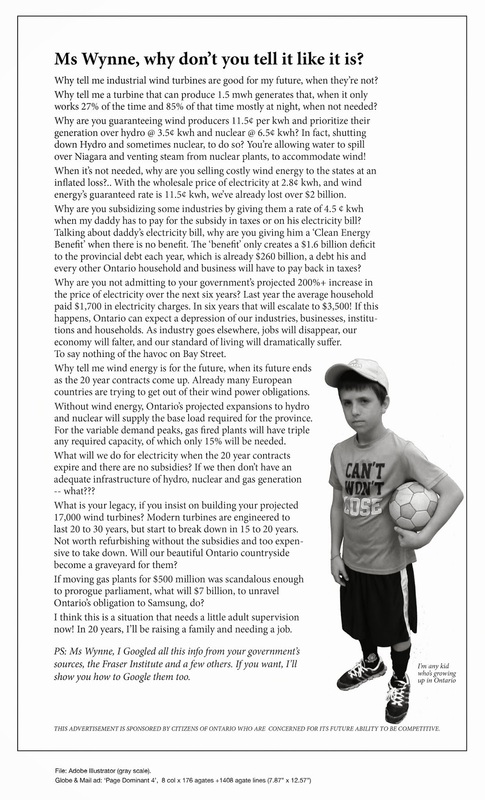 Amazingly, the Ontario government recently invited proposals for even more subsidized, unneeded and unreliable wind factories and solar farms. We now know gridmonsters cannot fight climate change. Ontario’s professional engineers report wind and solar factories are actually causing an increase in carbon dioxide emissions. The federal government is an accomplice. It budgets our tax money to support the proliferation of provincial green energy fantasies. It ignores its responsibility to protect endangered and migrating wildlife from habitat destruction and migration hazards, and to protect humans from unhealthy turbine noise. It ignores its duty to safeguard Charter rights of rural citizens seeking quiet enjoyment of their homes. Rural municipal governments know that wind and solar factories damage local economies and tourism. They realize gridmonsters are hazardous to humans and wildlife, drive up electricity prices, devastate neighbourhoods, depress property values and erode municipal tax bases. Provincial and federal governments do not care about local constituents, endangered and migrating wildlife and electricity prices. Rural municipal governments do care. They need to regain their authority to manage energy-related industrial developments in their own back yards. If we can’t consume the energy generated by gridmonsters at the moment it’s produced, we need to store it, or get rid of it affordably. It would probably be better to get rid of the politicians and the legislation that caused this problem. One way or another, we must put a stop to the gridmonster scam.